The many plants we consider weeds are hated for the simple fact that they grow where we don't want them to, and they do so with considerable vigor and tenacity. In many ways, the plants we call weeds are genetically superior to the landscape plants we find more desirable since they thrive so readily. But a great many of these so-called "weeds" have other uses that we overlook in our frenzy to eradicate them from our lawns and gardens. Two such plants are clover and dandelions. Clover is usually considered a weed and is fought with herbicides and other remedies by homeowners and landscape professionals in their quest for a perfect lawn containing nothing but turf grasses. A little reflection and botanical knowledge though can show you that white clover can be an ideal component within a blend of turf grasses. The fact that clover is a legume means that it actually makes its own nitrogen and fixes it in the soil. Not only does clover not require any nitrogen fertilizer, but it also supplies nitrogen for other nearby plants. Add this to the fact that clover is drought-tolerant, and we soon begin to wonder why we don't want clover in our lawns. In fact, clover actually was an intentional part of the typical American lawn prior to World War II. At that time, clover was a part of widely available seed blends, along with fescues, ryegrasses and Kentucky bluegrass. Because of its ability to thrive in poor soil, fix its own nitrogen and survive in drought conditions, clover was deliberately added to grass mixes in order to aid in the growth of the surrounding grasses. It wasn't until shortly after WWII, with the advent of suburbia and a naiveté towards the new world of chemicals, that clover became stigmatized. Although clover is different from weeds like and plantain, it was still broadleaved and succumbed to the new weed killer chemicals being sold to the public. It wasn't long before the chemical manufacturers were able to convince everyone that clover was bad, too— just another weed to eliminate in the quest for the perfect lawn. The most common clover for lawns is the white clover (trifolium repens) commonly found in fields, ditches, roadsides and anywhere else it has managed to take hold. Characterized by its three-part leaves and white and pink-tinged flowers, clover is low growing and maxes out at about six inches with the flowers usually rising above the leaves. Red clover (trifolium pratense), named for its dark pink flowers, is also abundant in the wild but is less desirable as a lawn due to its higher growth habit—up to 14 inches. Several species of clover are widely used as forage crops for domestic animals and as a soil-improving crop in agricultural farming. Easily grown in a variety of conditions and high in nutrients, clover makes an ideal field crop for cattle and other grazing livestock. Clover's ability to fix nitrogen from the air enriches the soil, adding nitrogen for the following year's crop. Bees and other pollinators are extremely attracted to clover flowers, and clover is an integral part of their life cycle. While a lawn teeming with bees may not be for everyone, it is also a boon to larger environmental concerns. Clover is among the first plants to green up and thrive in the spring, and it retains its green color even in drought conditions. The low growth habit of white clover means it can go without mowing all season long if desired. A clover lawn needs only to be mowed a couple of times a year to maintain its appearance. Clover is the ideal lawn surface for homes where there is little activity on the lawn and the desired result is more aesthetic than functional. For high activity lawns, clover blends are making a comeback and can once again be a part of the lawn mix along with grass seed. A lawn seed blend including clover is ideal for an all-purpose, low-maintenance lawn, especially in poor soil. People wanting a more natural lawn maintenance regimen or people in areas affected by pesticide bans benefit from adding clover to the lawn. The number one most hated weed in America is the lowly dandelion. Where previous generations would make salads and wine with the dandelion, we now try our very best to eradicate it by all means necessary. The dandelion is hated by homeowners and gardeners precisely because of its genetic superiority: it is a prolific reproducer that can infest a lawn in very little time. Years ago, lawns were usually a blend of grass species, clover, dandelion, and other plants but such practices are now long out of style, and a lawn with such diversity is usually frowned upon or even outlawed by local ordinances or homeowner association regulations. The chemical industry has also played a large part in promoting the idea that the only good lawn is one that consists of 100 percent turf grasses. The dandelion is a casualty of that mentality. Yet who doesn't smile in the spring when seeing a wild meadow brightened by the "wildflower" known as the dandelion? Easily recognizable by its yellow flower, white puffy seed head and distinct, jagged leaves, dandelion (Taraxacum officinale) is a typical broadleaf weed emerging in the early spring with continuous flowering beginning several weeks later. Dandelions can reproduce both from their taproot and by seed. This perennial weed will germinate from seed all season long and can be very persistent and competitive in a lawn. Dandelions can grow in most conditions and soil types. Dandelions can be spot-treated with a broadleaf chemical herbicide containing triclopyr or a mix of MCPP, 2,4-D, and dicamba. For most effective control, treat early in spring before the first generation goes to seed, then continue to spot spray as needed throughout the season. Weed-n-Feed products can also be effective dandelion killers but are outlawed in much of Canada and are increasingly seen as an irresponsible way to handle weed control. Weed-n-Feed products deposit large quantities of chemicals on lawns that can then make their way into water supplies. A major grievance about dandelions is their ability to travel. Their ubiquitous seeds float freely on the wind and your best efforts at keeping them off your lawn can easily be stymied by neighbors who are not as diligent at their own weed control efforts. Dandelions thrive in thin, weak turf so providing conditions favorable to turf growth is the best way to naturally control them. Practicing organic weed control is more about prevention than control. If the dandelions have gone to seed, collect lawn clippings to prevent spreading. Dandelions can be dug out by hand, but to be effective the entire root must be removed to prevent the plant from regenerating. Using a "weed-popper" tool on a moist lawn is an effective practice. 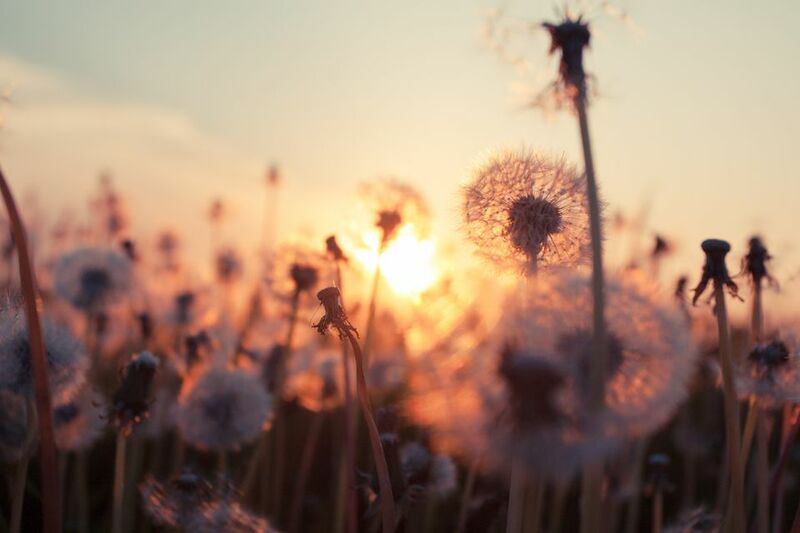 Dandelions love soil with low calcium levels, low pH and high potassium, so a common-sense solution preventive measure is to have your soil tested and to add calcium and lime if necessary. Looked at from the longer vantage point of history, dandelions are better known as a food source than as a lawn weed. For centuries, people have known the health benefits of ingesting dandelion. They are packed with vitamins, minerals, and antioxidants and are known to have medicinal properties to treat everything from digestive disorders to eczema and arthritis. Dandelion leaves are known to be slightly bitter and have a spicy quality similar to arugula. As such, they are great in salads, on sandwiches or steamed and served like any other leafy green. The root can be used as a coffee substitute and the flowers are used in salads and as a garnish. There are many dandelion recipes including cream of dandelion soup, dandelion syrup, and dandelion wine. Dandelions are best harvested in the spring when the shoots are young and tender. Avoid picking dandelions near roadsides or other areas where they may have absorbed pollution or pesticides.